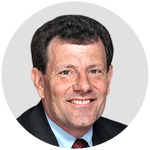 The title of Kristof's op ed, Trump kowtowing to MBS, suggests that Trump might fear that the Saudis could leak that he himself gave the green light for what eventually happened. Khashoggi had originally gone into the Saudi Embassy in Washington, D.C. to apply for his marriage papers. He was told to go to the one in Turkey. His fiancée is Turkish. Could the conspiracy have been born then?